Agent Creative craft compelling and convincing digital stories and commercial pieces. From simple vox pops ‘people on the street opinions’ to live event coverage to high end internal and commercial productions. We provide full production services location and studio including; script, styling, art direction, lighting, sound, story boarding, exquisite photography, music animation and voice overs. Celebrating the success and expertise of Australia and New Zealand’s elite travel professionals with a whole host of stars – Cathy Lette, Steve Jacobs, Catriona Roundtree, David Reyne and Livinia Nixon. This piece is filmed and edited on the night and premieres at the conclusion of the award presentation. Australia and New Zealand Launch of the Azurion 'new generation image guided therapy platform'. Held at the Museum of Contemporary Art, overlooking the Sydney Harbour Bridge and Opera House. The event focussed on innovation, independent research findings and the needs of interventional cardiologists and their clinical teams. Philips Azurion Interview with Dr Atul Gupta. Chief Medical Officer for Philips’ Image Guided Therapy. A series of interviews were produced for online and internal communications. TAC - Jimmy’s Story as part of the "Towards Zero" integrated launch, a series of client stories were commissioned to illustrate personal experiences of a TAC client. It also aimed to highlight the TAC's the new approach to care and support. Let’s Beat Bowel Cancer – Produced to commemorate the 10th year anniversary of the event. Used on line and with sponsors and stakeholder presentations. Kayla’s Story - Kids Under Cover We are proud to have supported Kids Under Cover for over 25 years. This has included the production of a series of 'personal stories' from young people and their carers who have had positive life changes with the support of KUC including the Studios and Scholarships programs. Sam Groth - TAC 'The Look' as part of an online campaign for TAC, Agent Creative directed and produced a series of short videos featuring Aussie Grand Slam Tennis player, Sam Groth, focussing on pedestrian awareness and safety on the streets. Based on a 4 week campaign each week featured different players and call to action. ME Bank - Customer Stories Customers of ME Bank were interviewed across Australia. We invited them to talk about the unique banking services provided by ME as well as the bank's approach to value and fairness. This series focussed on the experiences of a group of customers who primarily worked in construction. We loved putting on our hard hats and steel caps and talking to the people building their own future! 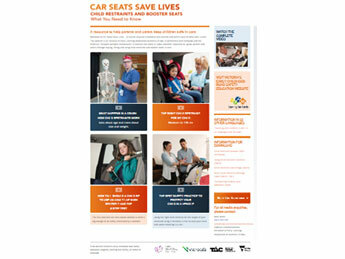 Car Seats Save Lives Originally tasked with refreshing a video addressing parents, educators and childcare workers about safe car seats for children, our involvement in this project has grown substantially to become an integrative consultative role working with the dedicated Early Learning Association of Australia along with their partners VicRoads and TAC. Capture the mood and insights of the meeting. Get extra opinions and expert point of view right at Conference or industry event. Build the content and continue the conversation. West Footscray Arts This is part of an online series created for Melbourne's West. Tija Lodins, General Manager of Footscray Community Arts Centre discusses the power of multicultural artistic endeavours. Interviews were captured during a one day conference and then produced for online sharing. Paul Constantinou, Chairman of Quest Apartment Hotels This is part of an online series created for Melbourne's West. Paul Constantinou, Chairman of Quest Apartment Hotels, talks about the business potential of the inner west and strategy for selecting new apartment hotel sites. Andrew Gill interviewed a range of guest speakers and conference delegates at the ALSA Retail conference 2016.